Lamb is a rich and flavorful meat. 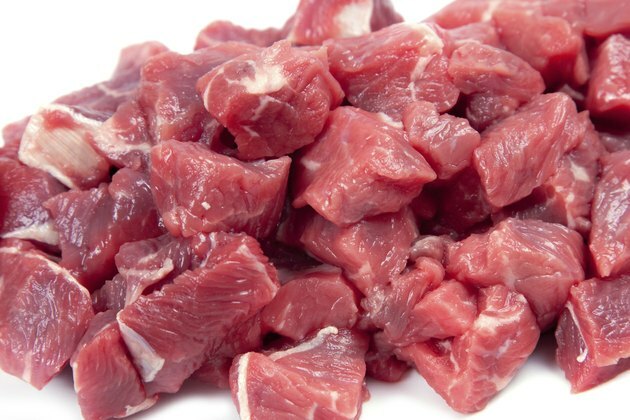 You can eat cubed lamb alone or include it in a variety of nutritious dishes such as stews and soups, or skewer it with a variety of vegetables. Lamb can be a tricky meat to cook, because if overcooked, it becomes tough and dry. Pour olive oil into a large skillet and heat over medium high heat. Use about 1 teaspoon of olive oil for every pound of cubed lamb you're cooking. Add your cubed lamb pieces and sprinkle with salt, pepper and other seasonings to taste. Cover and cook the lamb for three to four minutes. Stir the lamb cubes using a slotted spoon. Cover again and continue cooking. Stir the lamb cubes every two to three minutes until all are golden brown and no longer pink. Remove the lamb cubes from the skillet using a slotted spoon. Soak your wooden skewers in water for 30 minutes to one hour. Thread the skewers with lamb cubes, alternating with chopped vegetables, such as bell peppers, potatoes and squash. Brush the lamb and vegetables with olive oil and sprinkle with salt, pepper and other seasonings to taste. Place the skewers on the grill and cook for two to three minutes. Turn the skewers over and continue cooking for two to three more minutes. Turn the skewers twice more, cooking for two to three minutes on each side. Remove the skewers from the grill and carefully push the lamb and vegetables off into a large serving bowl. Spray your roasting pan with nonstick cooking spray. Scatter your lamb cubes evenly in the roasting pan. Sprinkle with salt, pepper and an assortment of dried herbs and seasonings as desired. Roast the lamb cubes for 10 to 15 minutes, stirring occasionally, until they are browned and no longer pink. Remove the roasting pan from the oven and allow your lamb cubes to cool slightly before using in a recipe. Serve your grilled lamb with low-fat plain yogurt for a Greek-inspired meal. Use sauteed or roasted lamb cubes to prepare hearty stews and soups. Many spices, such as turmeric, curry, coriander and paprika, can enhance the flavor of your lamb. You should cook lamb to an internal temperature of 145 F and let it rest for three minutes before serving.